Esau’s descendants would produce a lineage that would attack and slaughter the Jews for centuries. Esau’s descendants included Haman, whose diabolical mind conceived the “final solution” of the Old Testament — the extermination of all Jews living in Persia. 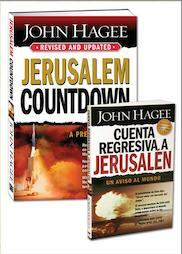 It was Esau’s descendants who produced the half-breed Jews of history who have persecuted and murdered the Jews beyond human comprehension. Adolf Hitler was a distant descendant of Esau. 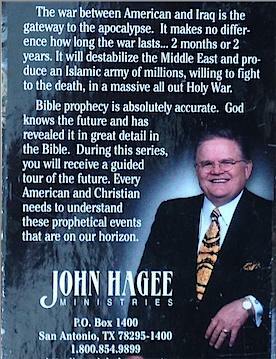 In his next sentence, Hagee goes on to make the false claim that in the 1976 book Adolf Hitler: The Definitive Biography, noted Hitler biographer John Toland “records that Hitler was part Jewish.” What Toland actually stated in his Hitler biography was “There is the slight possibility that Hitler’s grandfather was a wealthy Jew named Frankenberger or Frankenreither.” Hagee’s identification of a miscegenated race of “half-breed Jews” tracing back to Esau seems to originate in theological ideas from the fringe, virulently racist white supremacist Christian Identity movement, as described in books such as Religion and The Racist Right: The Origins of the Christian Identity Movement, by leading authority Dr. Michael Barkun. 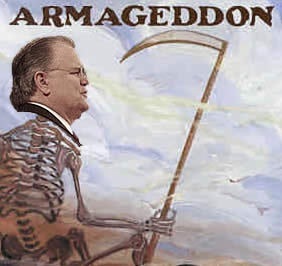 While John Hagee has for decades loudly and publicly condemned anti-Semitism, his writings and sermons have nonetheless promoted some of the most influential and inflammatory anti-Jewish tropes of the modern era, such as the claim that predatory Jewish bankers control international finance and prey upon the masses of humankind. It may be shocking to you but I believe that America’s economic problems are not created by market conditions, they are planned and orchestrated to devalue and to destroy the value of the dollar. 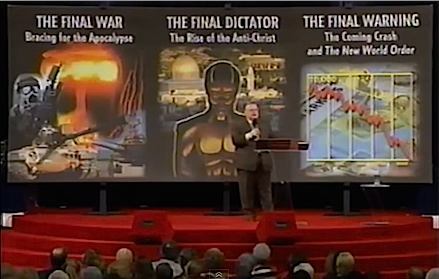 It was done by an unseen government that I’ll discuss later in this message. [..] Our economic destiny is controlled by the Federal Reserve system that is now headed by Alan Greenspan. Think about this. It is not a government institution. It is controlled by a group of Class A stockholders including the Rothschilds of Europe and the David Rockefellers of America… So get this one thought. The value of the dollar is controlled by an agency which is not controlled by America. You don’t have to have a Ph.D. in finance to understand that. The value of your dollar is controlled by an organization, the Federal Reserve that is not controlled by America. That’s a fact. 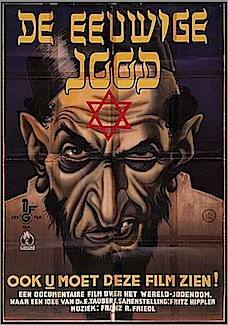 The author was Henry Ford, who in the 1920s commissioned the writing of the infamous anti-Jewish tract series The International Jew: The World’s Foremost Problem that expanded upon anti-Jewish conspiracy theories outlined in the Protocols of the Elders of Zion, the notorious anti-Jewish propaganda document forged by the Russian Tzarist secret police. Henry Ford placed blame for the start of World War One squarely on Jewish finance. “I know who caused the war: German-Jewish bankers,” declared Ford in 1915. In his 1920 tract series, articles such as “Jewish Power and America’s Money Famine” attributed the economic misfortunes of average Americans, such as farmers, to alleged Jewish control of gold supplies. 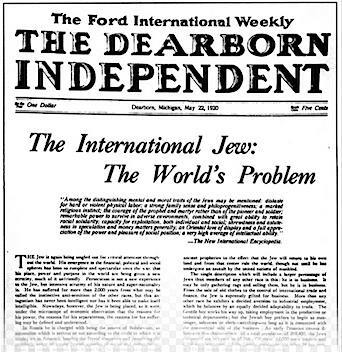 Henry Ford paid for The International Jew to be translated into German and distributed in mass quantities in Germany. In post-WW2 testimony at the Nuremberg War Crime Tribunals, it emerged that Ford’s anti-Jewish tract had deeply influenced leading Nazis such as Hitler Youth leader Baldur von Schirach. The extended quote above, by Henry Ford, was originally published in Ford’s tract series The International Jew. As may be the case with some contemporary Christian Zionists, Ford did not believe himself to be an anti-Semite. For years the automaker annually gave a new Model T Ford to Rabbi Leo M. Franklin, who lived in Ford’s former Detroit neighborhood. Previous Post Are You a Male Victim of Domestic Violence?